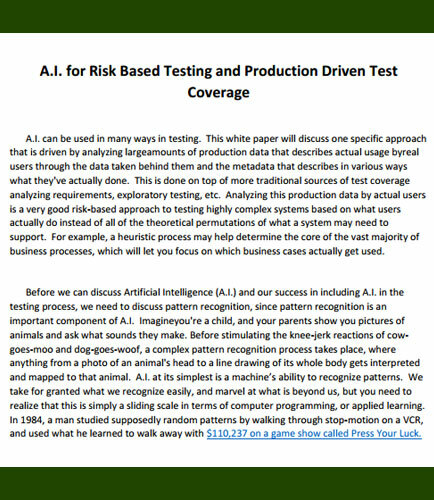 "Artificial Intelligence (AI) in Risk Based Testing"
Analyzing large amounts of production data by actual users is a very good risk-based approach to testing highly complex systems based on what users actually do instead of all of the theoretical permutations of what a system may need to support. Is software testing capable of employing A.I. approaches, or will human software testers soon be bested by computers as well? Risk-Based Testing-Which test cases are most important and most likely to encounter failure, and how do you limit the count?